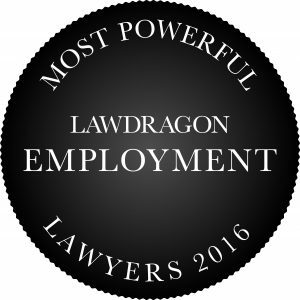 Lawdragon’s Guide to The Most Powerful Employment Lawyers also features 40 Up and Comers in Employment Law, presented below. Click here to return to the Top 100, or view the Top 20 in Employee Benefits, the Top 20 in Traditional Labor & Employment Law, the Top 20 in Immigration Law, or the Hall of Fame list. Reginald W. Belcher Turner Padget Columbia, S.C.
Meredith S. Campbell Shulman Rogers Potomac, Md. David N. Levine Groom Law Group, Chartered Washington, D.C.
Lynden Melmed Berry Appleman & Leiden Washington, D.C.
Seth J. Safra Proskauer Washington, D.C.
Jason C. Schwartz Gibson Dunn Washington, D.C.
Brian Sinclair Rutan & Tucker Costa Mesa, Calif.
Denise L. Wheeler FordHarrison Fort Myers, Fla.